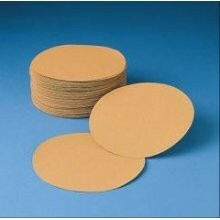 3M 6" Hookit Gold Film Sanding Discs. 100 discs per box. Design for use on paint and primer. Abrasive product that is durable and long-lasting. Hook and loop attachment system. 80 grit 75 discs to a box. All other grits 100 discs to a box.